On the afternoon of June 5, 1989, I was lying in bed. First, several doctors from the school suddenly came to our house to give me a shot. At almost the same moment, they asked my husband, Jiang Peikun (蒋培坤), to come outside. Seeing this, in my heart, I was 80 or 90 percent certain [of what had happened]. 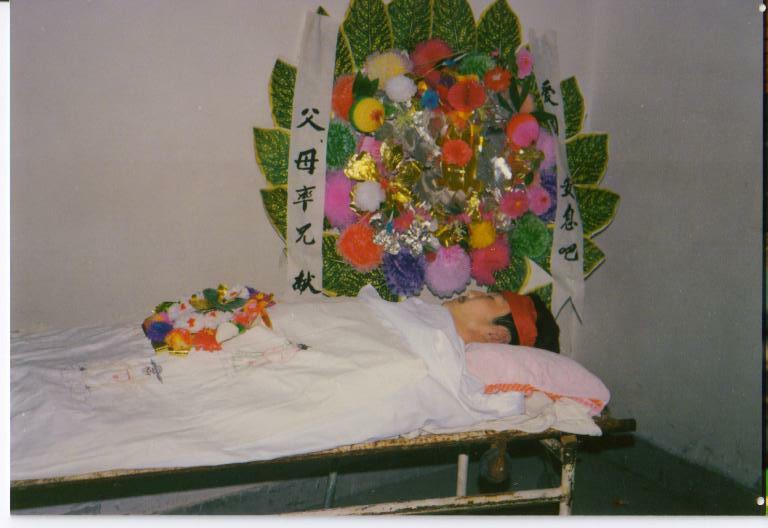 A while later, Jiang came back upstairs and said to me: "Our son is gone!" This grievous news directly from the mouth of my husband confirmed the premonition I had felt over the previous days. All my hopes and fantasies vanished in a split second. Yet I was completely calm at that moment, and did not faint. My mind was blank, and I lost my ability to think—it was as if time had stopped and the air had solidified. I could not utter a thing. I could only blankly stare at the people around. My coworker yelled, “Ding Zilin, go ahead and cry! Ding Zilin, have a good cry!” With everyone’s pushing and pulling, and shouting, I finally cried. However because prior to this, the doctor had given me a shot of tranquilizer, I fell into a deep sleep. When I woke up again, I discovered that my legs had become so weak I wasn’t able to stand or walk, but my mind was clear. I lay in bed waiting for each minute and second to pass. I wanted to save up my strength, hoping that at 4 o’clock I would be able to go to Zhongguancun Hospital to say a final farewell to my son’s body. At that moment, someone came to my house and told me there was public fury at Jielian’s school, the High School Affiliated to Renmin University of China. The students, one after another, all requested that the flag at the Monday morning flag-raising ceremony fly at half-mast for Jielian. The school leaders did not dare do this; they instead canceled the longstanding daily ritual. His classmates were sobbing inconsolably, and would not even attend class. They demanded to go to the hospital to say goodbye to Jielian’s body. Jielian’s father and I thought: although the hospital wasn’t far from school, the streets were covered with heavily armed martial law troops, with a soldier posted at every three steps and a sentry at every five. And often, military vehicles still whirled by. If, by chance, any grief-stricken students were to say or do something intemperate to the soldiers, that might invite another fatal disaster. We heard that the children later tearfully accepted our advice. They folded many small white flowers out of paper and hung them all over the school’s mottled campus walls, silently sending off their onetime classmate. I still cannot remember how I was carried into a small van and taken to Zhongguancun Hospital, nor how I was taken to the hospital’s mortuary. The only lasting impression in my mind is my son lying quietly on a wooden plank, his eyes slightly closed, and his face peaceful—as if he was quietly asleep on his own bed, except that his fair-skinned face was drained of all color. He had stopped breathing for two days already, but the blood inside his body was still flowing, which continued to seep out, dark red, in the chest area of the newly changed red and white school uniform. Seeing this fresh blood stain, I was overcome with grief. A pulsing life was smothered just like that. I also realized, while my son’s face was serene, his eyes were not completely closed. I knew he was willing to have his just-begun life ended, to leave his loving parents, classmates, and close friends just like this. I threw myself towards my son, but everyone holding on to me gripped my arms and held me back tightly. They did not let me touch the body. They said the weather was too hot. The body could easily be damaged. I begged—let me kiss my son one last time! I madly struggled and shouted. Only then did everyone, unable to bear it, let go of my arms. I finally touched the son to whom I gave birth and raised. I first touched his hand. Since he was young, these long slender fingers, which had written such careful and neat Song-Dynasty style characters, were now freezing cold, as if he had just crawled out of an ice cave; I also caressed his head of shiny, thick black hair—which he treasured the most while he was alive. Starting from childhood, he would never agree to go to a barber shop and let other people mess with his hair. Each time he would have his father trim his hair; and his father, no matter how busy, would always patiently, with comb and scissors, fix it until his son, examining his hair left and right, was completely satisfied. Now that he must leave us, let me, his mother, comb out his hair one last time. And now that he was gone, I tidied up one last time the narrow, red strip of cloth on his forehead. From the start of the 1989 student movement, every time before he left the house to participate in the movement, he would stand in front of the mirror and tie that strip of red cloth—on which he had placed his dreams and yearnings—on his forehead in a solemn manner. “Little Jielian! Little Jielian! Mother came to see you!” I wailed, my heart torn. But even a thousand calls would not yield a response. He lay there quietly, like a reclining white marble statue. People tried again to pull me away. I knew this was the last goodbye. After this, I would never see my son’s face again. Then, with strength which came from some unknown place, I struggled free of them again. I bent down and kissed his cheek. That day, I don’t know how I separated myself from my son’s side, or how I left the hospital and went home. After coming home, I was paralyzed in bed and could not move. I could not think of eating or drinking, and was unable to fall asleep. I cried all day and all night, and felt that my life had come to an end. June 7 was the day of my son’s cremation. Our family and close friends were worried that I would be overcome by grief and didn’t let me go to personally send him off no matter what. My husband, in trying to suppress his grief in order to take care of me, was also on the verge of collapse. He was also dissuaded from going and told to stay home. After the funeral, my eldest son had to return to his school. Before leaving, my previously introverted son stood before my bed, crying and begging me: “Mom! My little brother is already gone. You must be strong! If something were to happen to you, what would we do?” I nodded in response to him. Not until many years later did I learn that after a discussion between them, my husband had my eldest son personally come plead with me. No one knows me as well as my husband. He knew, at that time, for me, in desperation, only my last remaining flesh and blood could reach out to me to save me. To prevent any incident, they hid all the knives, scissors, ropes, and those kinds of things. For a long period after my son died, I spent my time in bed. Many people came to call on us to convey their condolences. Among them were close friends and family, acquaintances, and also people I didn’t know well. There were even some who had harmed me during the Cultural Revolution. To this day, I deeply believe that they all came with genuine feelings of sympathy. They turned their shared anger towards a military that killed innocent civilians into sympathy and loving care for the survivors, which they poured into our family. This precisely was a true portrait of the feelings of Beijing residents at that time. Although tanks and machine guns suppressed the resistance movement of students and Beijing residents, Beijingers were hammered into shape in fire and blood—their hearts did not die, and their blood did not go cold. Even though my body was resting, my mind did not become still. I repeatedly thought: I had not lived the life of a sage. Since arriving in this world, I had only wanted to live an ordinary life. In the previous half of my life, I had been ignorant, had done wrong and stupid things, and sometimes endured condemnation of my conscience; but I had never wanted to harm others, and still thought of myself as an upstanding person. But then why did such a harsh punishment fall on my head? As a mother, I was not able to protect my child or take his place in death, and can only drag on this life—neither quite living nor dead. Within our three-room home, my son’s silhouette was floating everywhere. At 1.82 meters tall [about 5’10”], my son had to lower his head to go in or out of the house. If he raised his hand or jumped, he could easily touch our ceiling, which was 2.75 meters high [about 9’]. A series of his dirty handprints still remained on the white ceiling. As long as he was at home, he would often sweetly call to me, “Mother!” I never knew from the corner of which room he was calling to me. My son and I would often “war” over the control of the television: when I wanted to watch a TV drama, he would fight to watch a ball game. If there was a ball game on—no matter what kind of ball game—he wouldn’t miss it. In the end, naturally, it was I who would relent. Each day at meals, he would sit closest to his father, habitually putting his thighs on his father’s legs; and on the table, with the appearance of an adult, he would eat while reading the newspaper. Every day, he was the first reader of the paper in our house. I often joked about his stinginess with his time: “Why isn’t the time heaven gave you not enough? Are you trying to live two lives in one?” Thinking about that, I can’t help but shudder. The morning of June 18, 1989, I limped along supporting myself on the wall and trying to slowly leave the house and go down the stairs, leaning on the metal handrail in the little yard. After sleeping half a month in bed, my legs were so weak that standing up caused them to shake. I looked up to the vast sky—the Beijing summer sky was such a clear blue, with white clouds floating about. People on Renmin’s campus were walking about, chatting, and smiling; time had passed, yet the sights and scenery were just as before, as if nothing had happened. My heart welled in sadness, and tears streamed down my cheeks. Editor’s note: This is an edited version of Part 13 of a 14-part essay. Click here to read the entire essay in Chinese. Ding Zilin (丁子霖) is a founder and former spokesperson of the Tiananmen Mothers, a group of family members of victims of the June Fourth government crackdown on the 1989 Democracy Movement. She was an associate professor of philosophy at Renmin University of China when her son, Jiang Jielian, was killed on June 3, 1989. The group has kept up the demands for justice, accountability, and compensation for June Fourth victims, survivors, and their families.